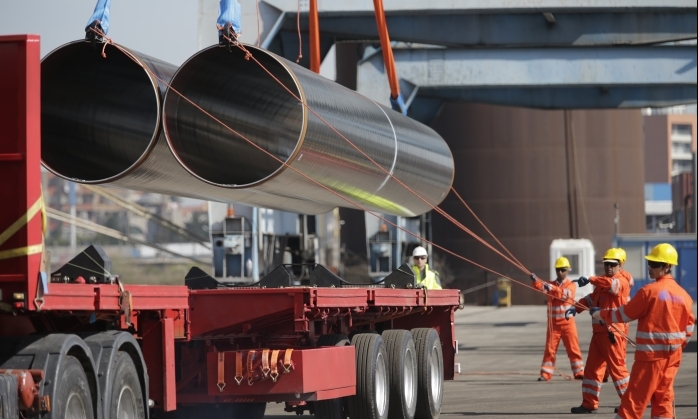 Construction of the offshore section of the Trans Adriatic Pipeline (TAP) designed to transport Azerbaijani gas to Europe will begin in 2019, TAP President Walter Peeraer said at the 25th Anniversary Caspian International Oil & Gas Conference in Baku on May 30. He said that TAP is ready by 72.7 percent. “More than 90 percent of the pipes have been welded, while 78 percent of the pipes have already been laid. As for the construction of the offshore section, it will start in 2019. This will be a 105-kilometer stretch at a depth of 820 meters,” Peeraer said. He noted that the Italian Saipem is engaged in preparatory activities for construction of micro-tunnels in southern Italy and Albania. Peeraer added that TAP plans to invest 55 million euros in Greece, Albania and Italy in the framework of social projects. TAP project, worth 4.5 billion euros, is one of the priority energy projects for the European Union. The project envisages transportation of gas from Azerbaijan’s Shah Deniz Stage 2 to the EU countries.